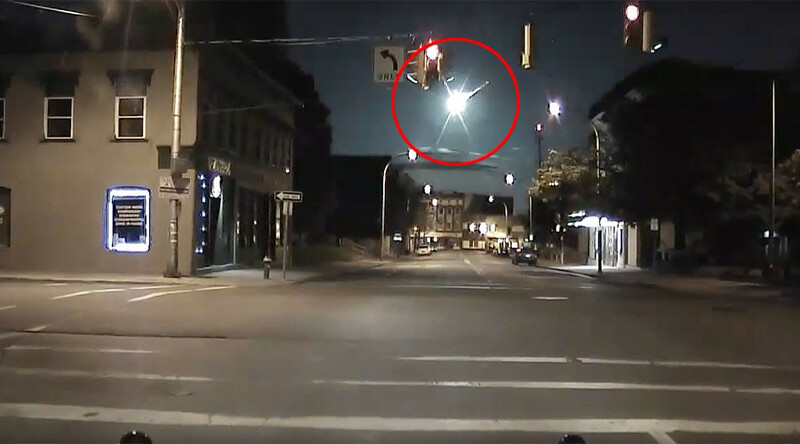 Police in New York State have captured crystal clear dashcam footage of a meteor streaking spectacularly across the sky. Sightings of the meteor over the northeastern US were reported on Tuesday morning, amazing all those lucky enough to catch a glimpse of the fireball. The American Meteorological Society has now received 700 reports concerning the meteor and shared videos of the celestial event. It seems the police were among the most successful in capturing the fiery streak on camera. Plattsburgh police officers were on patrol at around 12:50 am when they saw the meteor shoot through the sky. The Police Department in Portland, Maine also uploaded dashcam footage from a traffic patrol. The AMS has also shared video recorded by a security camera at Burlington International Airport in Vermont that shows two objects entering the Earth’s atmosphere, explaining that the meteoroid had broken up during entry.